However, it is well documented that feeding DDGS has no appreciable effects on pork lean quality and sensory characteristics and, therefore, provides a consumer eating experience similar to pork produced from pigs fed corn/soybean meal diets (Xu et al., 2010b; Leick et al., 2010; McClelland et al., 2012). One of the most consistent effects of feeding DDGS diets to growing/finishing pigs is a slight reduction in carcass yield. Although this response does not always occur when feeding DDGS diets, it is fairly common. The reduction in carcass relative to live bodyweight is a result of the increased weight of the viscera (gastrointestinal tract) from feeding high-fiber diets (Overholt et al., 2016). However, pork producers in the U.S. are no longer paid based on a grade-and-yield carcass pricing system but instead are paid on an optimal range in carcass weights and estimates of carcass lean percentage determined by individual pork processors. Therefore, a reduction in carcass yield from feeding DDGS diets can lead to suboptimal pork carcass weights and prices if the reduction in carcass yield is not considered at the time of marketing finishing pigs. My team conducted a meta-analysis of 20 studies published since 2010 that reported carcass yield responses from feeding various dietary levels of DDGS to growing/finishing pigs (Asmus et al., 2014; Coble et al., 2017; Cromwell et al., 2011; Davis et al., 2015; Duttlinger et al., 2012; Graham et al., 2014a,b,c; Hardman, 2013; Jacela et al., 2011; Jha et al., 2013; Lee et al., 2013; McDonnell et al., 2011; Nemechek et al., 2015; Overholt et al., 2016; Pompeu et al., 2013; Salyer et al., 2013; Wang et al., 2012; Wu et al., 2016c;Ying et al., 2013). A total of 75 observations used in this analysis showed that for every one percentage unit increase of DDGS inclusion rate in growing/finishing pig diets, carcass yield was decreased by 0.022%. The magnitude of this effect appeared to be greater when feeding high-oil (>10%) DDGS sources because feeding reduced-oil DDGS diets resulted in no significant change in yield. Furthermore, the use of either the net energy (NE) or metabolizable energy (ME) systems when formulating DDGS diets resulted in a similar reduction in carcass yield. Knowing the expected reduction in carcass yield is useful when determining the extra number of days on feed necessary for pigs to achieve desired final carcass weights when fed DDGS diets. Another common alternative for managing this potential carcass yield reduction is to withdraw or reduce the amount of DDGS in the late-finisher diets a few weeks before harvest. However, it is important to note that the percentage of carcass fat-free lean was not affected by feeding diets containing high-oil or reduced-oil DDGS or the use of the ME versus NE energy systems in this meta-analysis. Corn DDGS also contains a relatively high amount (5-12%) of corn oil, which is high in polyunsaturated fatty acids, especially linoleic acid. The amount of unsaturated fatty acids in swine diets directly affects the fatty acid profile and increases the unsaturation of pork carcass fat depots (e.g., back fat, belly fat, and jowl fat). Increased polyunsaturated fatty acids in pork carcass fat cause it to become softer and less firm. Several studies have consistently shown that feeding increasing amounts of DDGS to growing/finishing pigs linearly reduce pork fat firmness (Xu et al., 2010a,b; Benz et al., 2010; Graham et al., 2014a,b; Davis et al., 2015). Pork fat firmness is commonly measured by calculating the iodine value (IV), which is the ratio of unsaturated to saturated fatty acid composition of a fat or oil. Firm pork fat is a desired characteristic, especially in bellies, because it tends to improve processed bacon slicing yields, has a longer shelf-life and is preferred by consumers. Therefore, one of the most significant challenges for feeding growing/finishing pigs diets containing high amounts of DDGS is to minimize the negative effects of feeding high amounts of corn oil on pork fat firmness. Currently, there are no official pork fat quality standards in the U.S., but many slaughter plants and pork processors consider pork fat to be acceptable if it has an IV of less than 74. As a point of reference, feeding corn/soybean meal diets without supplemental fats or oils will generally result in a back fat IV of about 63-68. However, depending on the amount of corn oil (from DDGS) in the diet, length of feeding and the presence or absence of other dietary lipid sources, studies have shown that feeding 30% DDGS diets can lead to back fat with an IV of more than 74. Fortunately, achieving the desired pork fat firmness when feeding DDGS diets can be achieved in multiple ways. First, because the consumption of linoleic acid is the primary driver of pork fat firmness or softness, feeding diets containing low-oil (5-7% crude fat) DDGS sources will reduce this effect compared with high-oil (7-12% crude fat) DDGS sources when added at the same diet inclusion rate (Wu et al., 2016a). However, adding supplemental sources of more saturated fat (e.g., choice white grease) to DDGS diets does not improve pork fat firmness (Davis et al., 2015). Second, limiting DDGS inclusion rates to 20% and feeding these diets through-out the growing/finishing period generally leads to acceptable pork fat firmness, but limiting diet inclusion rates to20% is contrary to the goal of achieving greater diet cost savings at higher inclusion rates. Third, high inclusion rates of DDGS can be successfully fed throughout the grower and early-finisher periods but reduced to low levels or removed from the diets for three to five weeks before harvest to achieve a back fat IV of 74 or less (Jacela et al., 2009; Xu et al., 2010b; Hilbrands et al., 2013). Another approach to managing pork fat firmness is to use pork fat IV prediction equations. Many nutritionists have used various pork fat quality prediction equations to estimate belly, back or jowl fat IVs when feeding different amounts and concentrations of oil in DDGS. Wu et al. (2016b) evaluated the accuracy and precision of using these prediction equations — which were based on the percentage of DDGS and the linoleic acid content in the diets, IV product and a more complex but more accurate equation (Paulk et al., 2015) involving several factors of diet composition and feeding conditions — to predict pork fat firmness of back, belly and jowl fat (Table). Overall, these results showed that reduced-oil DDGS generally minimizes the negative effects on pork fat firmness from feeding DDGS diets, as indicated by the lower IV of carcass fat depots. However, the magnitude of this improvement does not appear to be proportional to the amount of dietary lipid intake and may be affected by differences in the digestibility of oil in DDGS (Kerr et al., 2013). It is also important to remember that fatty acid composition varies among pork carcass fat depots. Jowl fat has a greater IV than back fat and belly fat, but back fat appears to be the most sensitive to changes in dietary lipid content than jowl and belly fat. 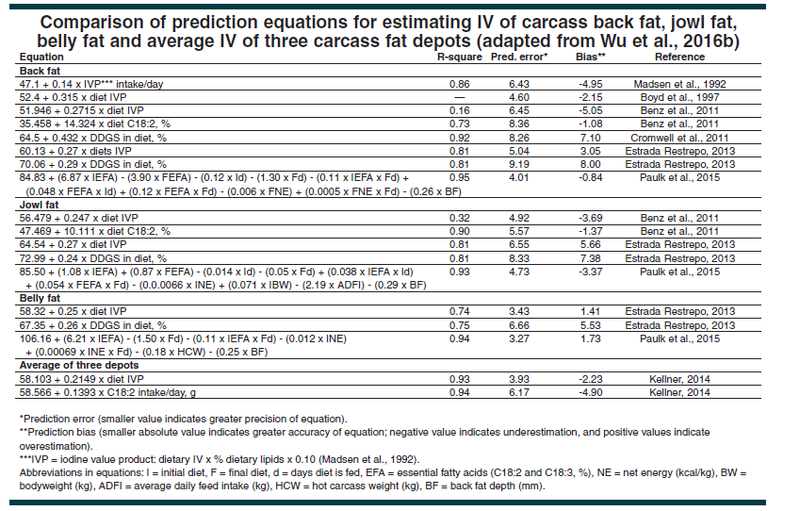 As shown in the Table, the use of published carcass fat IV prediction equations resulted in variable precision (prediction error) and accuracy (bias) in estimating the IV of carcass fat depots. It appears that using factors such as dietary energy content, growth performance, and carcass composition measures, as indicated in the Paulk et al. 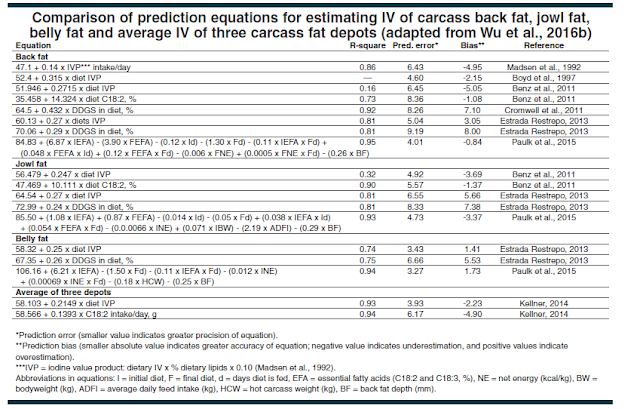 (2015) equations, results in improved carcass fat IV predictions versus using those based on only the characteristics and quantity of dietary lipids. In contrast, using the percentage of DDGS in diets as a predictor of carcass fat depot IVs results in the poorest prediction. However, the magnitude of the prediction error and bias of these equations needs to be reduced to achieve more predictable carcass fat IV responses when feeding DDGS diets to growing/ finishing pigs. Last, commercial additives such as Lutalin (conjugated linoleic acid from BASF) and Lipinate (NutriQuest) have been shown to be effective in preventing soft pork fat when feeding pigs DDGS diets. These discoveries have been essential for allowing pork producers to feed relatively high dietary inclusion rates of DDGS to reduce feed costs while achieving acceptable pork fat quality. Asmus, M.D., J.M. DeRouchey, M.D. Tokach, S.S. Dritz, T.A. Houser, J.L. Nelssen and R.D. Goodband. 2014. Effects of lowering dietary fiber before marketing on finishing pig growth performance, carcass characteristics, carcass fat quality and intestinal weights. J. Anim. Sci. 92:119-128. Benz, J.M., S.K. Linneen, M.D. Tokach, S.S. Dritz, J.L. Nelssen, J.M. DeRouchey, R.D. Goodband, R.C. Sulabo and K.J. Prusa. 2010. Effects of dried distillers grains with solubles on carcass fat quality of finishing pigs. J. Anim. Sci. 88:3666-3682. Benz, J.M., M.D. Tokach, S.S. Dritz, J.L. Nelssen, J.M. DeRouchey, R.C. Sulabo and R.D. Goodband. 2011. Effects of dietary iodine value product on growth performance and carcass fat quality of finishing pigs. J. Anim. Sci. 89:1419-1428. Boyd, R.D., M.E. Johnston, K. Scheller, A.A. Sosnicki and E.R. Wilson. 1997. Relationship between dietary fatty acid profile and body fat composition in growing pigs. Pig Improvement Co., Franklin, Ky.
Coble, K.F., J.M. DeRouchey, M.D. Tokach, S.S. Dritz, R.D. Goodband and J.C. Wood- worth. 2017. Effects of distillers dried grains with solubles and added fat fed immediately before slaughter on growth performance and carcass characteristics of finishing pigs. J. Anim. Sci. 95:270-278. Cromwell, G.L., M.J. Azain, O. Adeola, S.K. Baidoo, S.D. Carter, T.D. Crenshaw, S.W. Kim, D.C. Mahan, P.S. Miller and M.C. Shannon. 2011. Corn distillers dried grains with solubles in diets for growing-finishing pigs: A cooperative study. J. Anim. Sci. 89:2801-2811. Davis, J.M., P.E. Urriola, G.C. Shurson, S.K. Baidoo and L.J. Johnston. 2015. Effects of adding supplemental tallow to diets containing 30% distillers dried grains with solubles on growth performance, carcass characteristics and pork fat quality in growing-finishing pigs. J. Anim. Sci. 93:266-277. Duttlinger, A.J., J.M. DeRouchey, M.D. Tokach, S.S. Dritz, R.D. Goodband, J.L. Nelssen, T.A. Houser and R.C. Sulabo. 2012. Effects of increasing crude glycerol and dried distillers grains with solubles on growth performance, carcass characteristics and carcass fat quality of finishing pigs. J. Anim. Sci. 90:840-852. Estrada Restrepo, J.E. 2013. Factors associated with variation in the fatty acid composition and iodine value of carcass fat in pigs fed increasing levels of dried distillers grains with solubles. M.S. thesis. University of Illinois at Urbana-Champaign. Graham, A.B., R.D. Goodband, M.D. Tokach, S.S. Dritz, J.M. DeRouchey and S. Nitikanchana. 2014a. The effects of medium-oil dried distillers grains with solubles on growth performance, carcass traits and nutrient digestibility in growing-finishing pigs. J. Anim. Sci. 92:604-611. Graham, A.B., R.D. Goodband, M.D. Tokach, S.S. Dritz, J.M. DeRouchey and S. Nitikanchana. 2014c. The interactive effects of high-fat, high-fiber diets and ractopamine HCl on finishing pig growth performance, carcass characteristics and carcass fat quality. J. Anim. Sci. 92:4585-4597. Hardman, S.J. 2013. Effect of dietary distillers dried grains with solubles (DDGS) and pig removal strategy at harvest on the growth performance, carcass characteristics and fat quality of growing-finishing pigs. M.S. thesis, University of Illinois at Urbana- Champaign. Jacela, J.Y., J.M. Benz, S.S. Dritz, M.D. Tokach, J.M. DeRouchey, R.D. Goodband, J.L. Nelssen and K.J. Prusa. 2009. Effect of dried distillers grains with solubles withdrawal regimens on finishing pig performance and carcass characteristics. Swine Day. p. 181-191. Manhattan, Kan.
Jacela, J.Y., J.M. DeRouchey, S.S. Dritz, M.D. Tokach, R.D. Goodband, J.L. Nelssen, R.C. Sulabo, R.C. Thaler, L. Brandts, D.E. Little and K.J. Prusa. 2011. Amino acid digestibility and energy content of deoiled (solvent- extracted) corn distillers dried grains with solubles for swine and effects on growth performance and carcass characteristics. J. Anim. Sci. 89:1817-1829. Jha, R., J.K. Htoo, M.G. Young, E. Beltranena and R.T. Zijlstra. 2013. Effects of increasing co-product inclusion and reducing dietary protein on growth performance, carcass characteristics and jowl fatty acid profile of growing-finishing pigs. J. Anim. Sci. 91:2178-2191. Kellner, T.A. 2014. Impact of dietary fat intake on carcass iodine value and pork fat quality. M.S. thesis. Iowa State University, Ames. Lee, J.W., D.Y. Kil, B.D. Keever, J. Killefer, F.K. McKeith, R.C. Sulabo and H.H. Stein. 2013. Carcass fat quality of pigs is not improved by adding corn germ, beef tallow, palm kernel oil or glycerol to finishing diets containing distillers dried grains with solubles. J. Anim. Sci. 91:2426-2437. Leick, C.M., C.L. Puls, M. Ellis, J. Killefer, T.R. Carr, S.M. Scramlin, M.B. England, A.M. Gaines, B.F. Wolter, S.N. Carr and F.K. McKeith. 2010. Effect of distillers dried grains with solubles and ractompamine (Paylean) on quality and shelf life of fresh pork and bacon. J. Anim. Sci. 88:2751-2766. Madsen, A., K. Jakobsen and H.P. Mortensen. 1992. Influence of dietary fat on carcass fat quality in pigs. A review. Acta Agric. Scand., Sect. A, Animal Sci. 42:220- 225. McClelland, K.M., G. Rentfrow, G.L. Cromwell, M.D. Lindemann and M.J. Azain. 2012. Effects of corn distillers dried grains with solubles on quality traits of pork. J. Anim. Sci. 90:4148-4156. McDonnell, P., C.J. O’Shea, J.J. Callan and J.V. O’Doherty. 2011. The response of growth performance, nitrogen and phosphorus excretion of growing-finishing pigs to diets containing incremental levels of maize dried distiller’s grains with solubles. Anim. Feed Sci. Tech. 169:104-112. Nemechek, J.E., M.D. Tokach, S.S. Dritz, R.D. Goodband, J.M. DeRouchey and J.C. Woodworth. 2015. Effects of diet form and type on growth performance, carcass yield and iodine value of finishing pigs. J. Anim. Sci. 93:4486-4499. Overholt, M.F., J.E. Lowell, E.K. Arkfeld, I.M. Grossman, H.H. Stein, A.C. Dilger and D.D. Boler. 2016. Effects of pelleting diets without or with distillers’ dried grains with solubles on growth performance, carcass characteristics and gastrointestinal weights of growing-finishing barrows and gilts. J. Anim. Sci. 94:2172-2183. Paulk, C.B., J.R. Bergstrom, M.D. Tokach, S.S. Dritz, D.D. Burnett, E.W. Stephenson, M.A. Vaughn, J.M. DeRouchey, R.D. Good- band, J.L. Nelssen and J.M. Gonzalez. 2015. Equations generated to predict iodine value of pork carcass back, belly and jowl fat. J. Anim. Sci. 93:1666-1678. Pompeu, D., B.R. Wiegand, H.L. Evans, J.W. Rickard, G.D. Gerlemann, R.B. Hinson, S.N. Carr, M.J. Ritter, R.D. Boyd and G.L. Allee. 2013. Effect of corn dried distillers grains with solubles, conjugated linoleic acid and ractopamine (Paylean) on growth performance and fat characteristics of late finishing pigs. J. Anim. Sci. 91:793-803. Salyer, J.A., M.D. Tokach, J.M. DeRouchey, S.S. Dritz, R.D. Goodband and J.L. Nelssen. 2013. Effects of standardized ileal digestible tryptophan:lysine in diets containing 30% dried distillers grains with solubles on finishing pig performance and carcass traits. J. Anim. Sci. 91:3244-3252. Wang, H., L.S. Wang, B.M. Shi and A.S. Shan. 2012. Effects of dietary corn dried distillers grains with solubles and vitamin E on growth performance, meat quality, fatty acid profiles and pork shelf life of finishing pigs. Livest. Sci. 149:155-166. Wu, F., L.J. Johnston, P.E. Urriola and G.C. Shurson. 2016b. Pork fat quality of pigs fed distillers dried grains with solubles with variable oil content and evaluation of iodine value prediction equations. J. Anim. Sci. 94:1041-1052. Wu, F., L.J. Johnston, P.E. Urriola, A.M. Hilbrands and G.C. Shurson. 2016c. Evaluation of NE predictions and the impact of feeding maize distillers dried grains with solubles (DDGS) with variable NE content on growth performance and carcass characteristics of growing-finishing pigs. Anim. Feed Sci. Technol. 215:105-116. Ying, W., M.D. Tokach, J.M. DeRouchey, T.E. Houser, S.S. Dritz, R.D. Goodband and J.L. Nelssen. 2013. Effects of dietary L-carnitine and dried distillers grains with solubles on growth, carcass characteristics and loin and fat quality of growing-finishing pigs. J. Anim. Sci. 91:3211-3219. Xu, G., S.K. Baidoo, L.J. Johnston, D. Bibus, J.E. Cannon and G.C. Shurson. 2010a. Effects of feeding diets containing increasing content of corn distillers dried grains with solubles to grower-finisher pigs on growth performance, carcass composition and pork fat quality. J. Anim. Sci. 88:1398-1410. Xu, G., S.K. Baidoo, L.J. Johnston, D. Bi- bus, J.E. Cannon and G.C. Shurson. 2010b. The effects of feeding diets containing corn distillers dried grains with solubles and withdrawal period of distillers dried grains with solubles on growth performance and pork quality in grower-finisher pigs. J. Anim. Sci. 88:1388-1397.